The beginning of our workshop was all about collecting ideas of Greek and local products and to write them down on a mind map. Our group of 13 people different ages, was actively thinking of products or services around Greece that are strongly connected with local production, tourism or tradition. For the Greek products in general a lot of food was mentioned, such as honey, lentils, almonds, olive oil, olives, yoghurt, feta cheese, Pastitio, Kefalotiri. 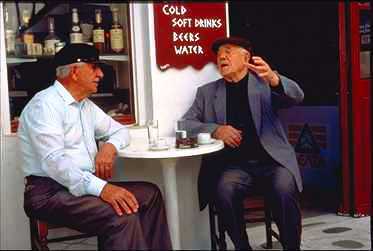 Also a lot of alcoholic products like Ouzo, Tsipouro, Metaxa, wine and liqueurs are well known. 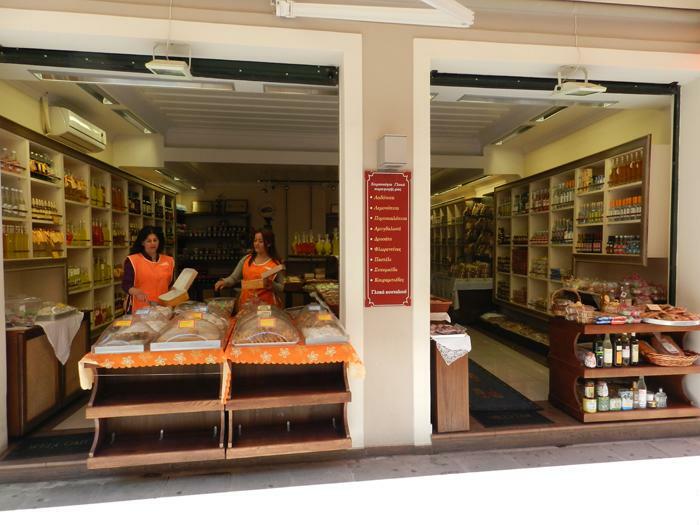 From Lefkada we could taste the typical dry salami. Through our brainstorming we learned about the different types of wine for instance Bertzamo or Bardeas. Also honey, Soumada, Pasteli, Madolato, pies, chocolate, Ladopita and the lentils were mentioned. 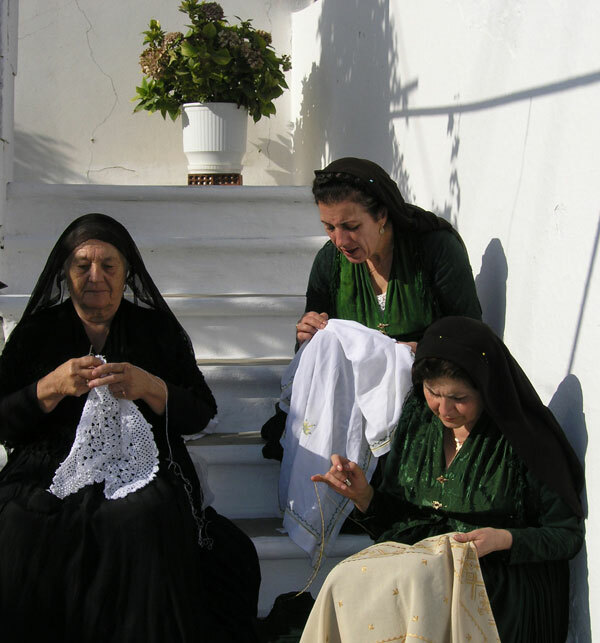 Moreover the embroidery and the typical Karsaniko stitch from Karia are quite famous. 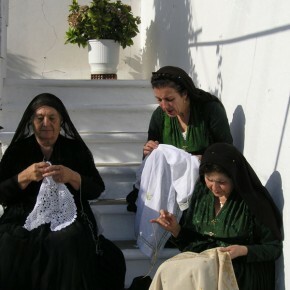 Part of the tradition is also the Lefkadian clothes that are shown in the festival week in August with its special women´s bra, called “Steka” or “Camcetto”. We heard about Sirti fishing, which is a method that is not wide spread and a product called Avgotaraxo. 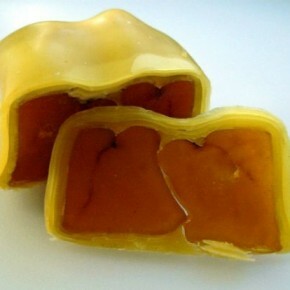 This “fish egg pie”, somehow comparable with caviar, the locals call it “the caviar of the poor” is imprinted on the picture on the right side. The association of Greece with white houses and blue window frames, that mostly comes from tourists and tourism is not confirmed if one takes an eye on the houses in Lefkada that are mostly colored in soft earth colors. Another interesting telling was about the production of salt in previous times. The following part of the workshop was about the question, if it is more necessary to support local supermarkets instead of big companies like Carrefour or Lidl and if this could be a possible way out of the economical crisis. Numerous participants were telling that they believe in the importance of buying products in local fruit shops, supermarkets or weekly markets. Not only because the direct support of neighbors, friends and their family is happening more visibly, also because through that the money that is spent remains in Greece and is not transmitted to the heads of big companies abroad. Additionally another important issue rose up connected with the priorities of Greek people in their consumer behavior. Obviously the willingness of spending more money on food with better quality, and of fair and biological production, is not yet predominant. Possibly for some people this will change in future, but unless there is no need, markets will not react to offer products (or a big variety) of fair trade or biological brands. 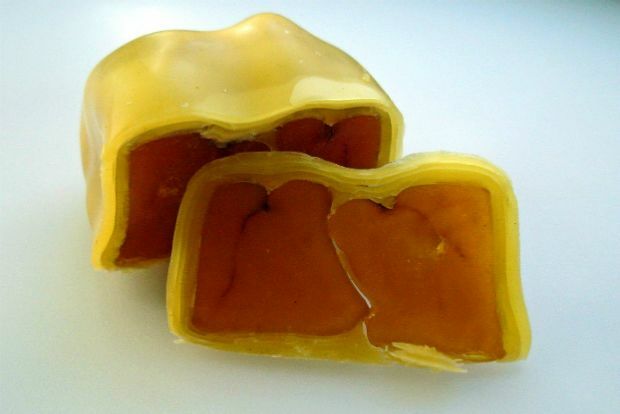 To the contrary also some of our Greek followers said that the need in Greece to those products isn´t that high, because the quality and closeness to nature is much higher than compared with big cities like London, Dublin or Paris, where almost all products are chemically produced. Again in opposite we also heard that even our local fruits are gen manipulated and not naturally anymore. Therefore the question of the need and the willingness came up again. Arguments of the not affordable prices of biological and fair products, that are well known higher, were also replied with the personal priorities of ones life. A lot of local people prefer to spend their free-time in coffee shops or other places, because they say that one can´t stay at “home” in Greece. In conclusion, it can be said that the line between keeping mentality and a healthy change of lifestyle, regarding to global awareness and the realization of the need of sustainability, is not always clear to separate. Therefore our night finished off in one of our local ouzeris, where the “parea” could get lost in thoughts and delight and of course, with tasting the Lefkadian salami one more time.